WizKids created a bit of a stir when they released Quarriors!, combining the popular deckbuilding mechanics seen throughout the boardgame market with many gamer’s hidden passion – dice. 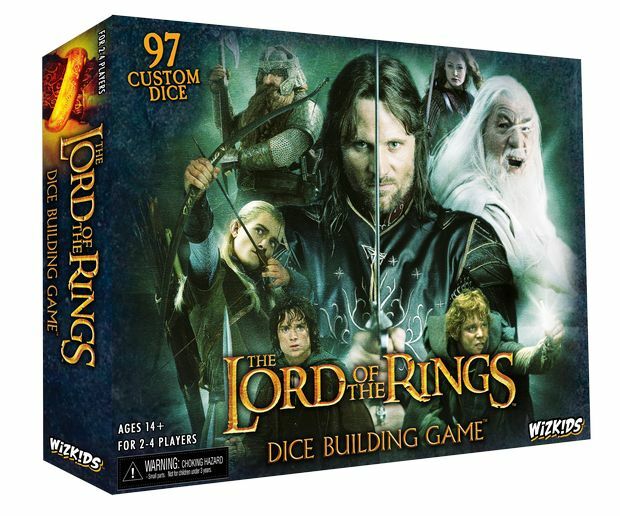 The Lord of the Rings Dice Building Game is a semi-cooperative game that uses the Quarriors! mechanics wedded to a Lord of the Rings theme. Players roll dice and then use them to fight and/or purchase new dice. Rather than fight each other (as in Quarriors! ), players are fighting against a neutral monster dice representing the forces of Sauron. The result is a game that will be immediately familiar to Quarriors! players (and, to a lesser extent, deck building games) that can be played cooperatively and has an easily recognizable theme. The theme and cooperative nature of the game make it much easier to get to the table with less experienced gamers. I’ve found it a bit rare to “lose” the game when playing purely cooperative, but the difficulty level can be adjusted using several variants to make the game harder. Players start with a pool of “basic” 10 dice in their bag. The rest of the dice in the game are associated with specific cards, with 4 dice assigned to each card. Cards include characters from the story (such as Frodo or Aragorn), artifacts (like spell dice in Quarriors! ), and Sauron’s dice. Each card describes the abilities associated with the faces of their associated dice. The cards have different front and backs, allowing some variety in play from game to game. Players start with a pool of dice in their bag, rolling five of them. Based on the faces of the rolled dice, a player will have units they can recruit and/or Fellowship points to spend (buying more dice or recruiting units.) Buying more dice is simply done by spending the appropriate points, while units are recruited by paying their “level” (1 to 3) in Fellowship points. Recruited units are used to “fight” any monster dice rolled Sauron’s dice pool, or left out for other players to “borrow” when fighting Sauron later in the round. Units that survive an entire round (as well as any “borrowed” units) score Glory points for their owner. (Quarriors! players will note there is no “culling” of dice in this game.) At the end of the game, the player with the most Glory points is declared the official winner. One all players have taken a turn, Sauron gets a turn. First, Sauron earns a corruption point (explained later) for every die remaining from his previous turn’s roll. His available (surviving) monster units then attack all the players’ recruited units, typically eliminating some or all of them. Player’s units that survive this round will score Glory points for their owner just before being discarded at the start of their owner’s turn. Next, Sauron spends corruption points accumulated during the past round. Points are primarily spent on “corrupting” one of the dice cards available for purchase. A die whose associated card is corrupted has no value when rolled, it is completely useless. Corrupting cards is the primary method for Sauron to win the game. Sauron needs to corrupt from 6 (2 player game) to 4 (4 player game) different cards in order to cause everyone to lose. During Sauron’s turn, the player controlling Sauron (for the moment) can spend their Glory points to reduce the amount of corruption available to Sauron. In addition, a player may forgo buying any dice on their turn and instead spend their Fellowship points to un-corrupt one of the cards. The pacing of the game is controlled by location cards. There are eight location cards, and if the fellowship are able to make it to the eighth card (the Grey Havens), they win the game. Location cards govern which dice (both Sauron and purchasable ones) are available at that moment in the game. 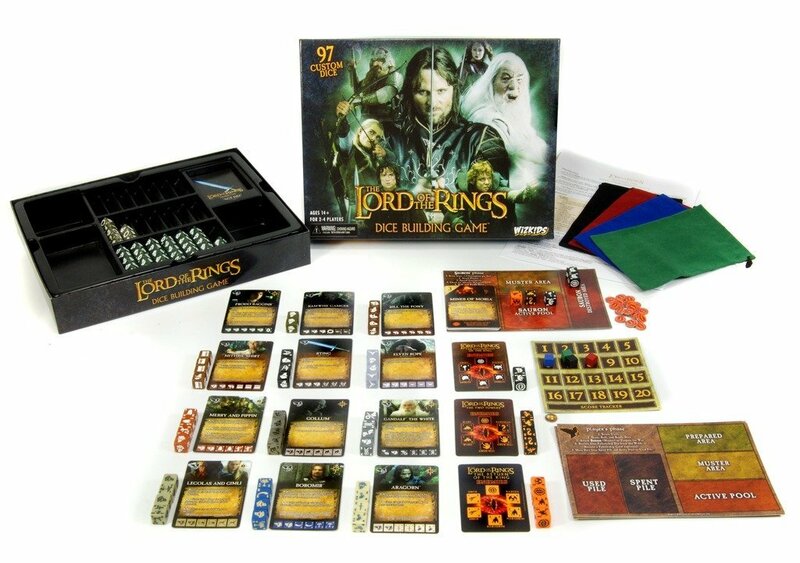 Thus, as players progress through location cards more powerful dice become available to purchase as well as more powerful Sauron dice begin to appear. The first few locations are fairly innocuous as players start to get the feel of the game (there are no Sauron dice at first and only a few available dice to purchase.) As the game goes on, things get more complicated. To move to a new location, players must eliminate all active Sauron unit dice. That is all the unit dice rolled at the end of Sauron’s last turn, there could still be dice in his pool waiting to be rolled on his next turn. This is simple at the start of the game, since there are no Sauron dice, but later in the game it can take several rounds in order to clear out Sauron’s horde completely. Meanwhile, Sauron is busy accumulating corruption and starting to lock down cards. The dice-building mechanics of Quarriors! lends itself well to a cooperative game. The decisions the players face are not so cut and dried that players will be tempted to try to play for each other. Meanwhile, keeping the game cooperative is a great way to teach new players the game, removing the direct competition and having the group win or lose as a team. When played purely cooperatively, the game is fairly easy to “win” but there are several variant rules that can be used to make it more challenging. When played semi-cooperatively (each player is also out to maximize their own Glory points), the game does get a bit more difficult as fewer players are willing to sacrifice their own standing for the greater good of the group. I like the location cards. They are quite detailed and not only provide progression and increasing tension in the game, they also contain most of the setup rules for the game – making it easy for new players to step through their first game setup. Overall, Lord of the Rings Dice Building Game is only slightly different than the Quarriors! game from which it is derived. People who can’t get enough of colorful piles of dice will obviously be attracted to it. It can be played cooperatively / semi cooperatively and has slightly easier rules (due to fewer dice ability types and no “culling” or dice elimination.) While not strong, the Lord of the Rings theme is sufficiently present to appease most fans of the genre. Patrick Brennan: Same experience as Quarriors, and about as meaningless a game. Any semblance of theme is out the window once you start having turns, which consists of pulling 5 dice out of a bag and rolling them. On a roll you hope to get enough resources to either pay for troops that you also just rolled, or to acquire a new powerful die, which will hopefully reward you with better rolls in future turns. And then you continue a la Dominion, pulling the next 5 dice on the next turn and so on. If a unit lasts until your next turn (ie it has defense higher than Sauron’s attack at the end of the round) then score victory points. Which makes every turn much the same as the last one, the only difference being you’ll gradually roll better dice as the game goes on … but it doesn’t overcome the sense of sameness. Most VPs wins but only if players fix up the characters that Sauron corrupts each round along the way. Which brings me to the point that it also features the crappiest mechanic in gaming atm, the semi-coop loss. If you’re coming last or second last, you have no incentive to act thematically and help out against the baddie, leave that to the players coming first. Which is meant to be a semi-catch-the-leader mechanic, but it being a dice game, all it does is make it random whether they can uncorrupt fast enough, and if they can’t, everyone loses. Bleh. And full co-op seems to be little challenge, or random, so it’s hard to see the point. All in all, the game turns into a dice slogfest that’s altogether barren of theme. It’s still playable, of course, but I’m not sure why it’d be a game of choice. Dan Blum: I liked it somewhat better than Quarriors, mostly due to the cooperative nature of the game; I’m not a big cooperative games fan in general, but in Quarriors the first player who can afford to buy a big creature and play it has a big advantage, which is not the case here. However, this shares a major problem with Quarriors in that there simply aren’t enough turns. Any deckbuilding or dicebuilding game needs to have enough turns to make it possible to not only buy interesting combinations of cards or dice, but have the combinations actually come out in play. Neither Quarriors nor this game have nearly enough turns for this to happen, and the problem is exacerbated by the fact that, unlike in a deckbuilding game, to use a combination you not only need to draw the dice on the same turn but roll them so they are on the relevant special power sides. In the game we played of this almost no special powers other than Frodo’s were used because they mostly didn’t come up, and most of the time when they did come up they weren’t useful. So it was a pure numbers game, and as such was quite dull. This entry was posted in Reviews and tagged dice, lord of the rings, quarriors, review, WizKids. Bookmark the permalink. I don’t remember if there are goblins in the game, but there are definitely goblins in The Hobbit.